Long before I was a wedding blog editor, I was a wedding photographer who was introduced to Two Bright Lights by a friend of mine who was using it. I instantly fell in love. Two Bright Lights is a website through which photographers (and vendors) can submit to hundreds of blogs and magazines in just a few easy steps. All you have to do is upload your images (up to 150), add vendors involved (and share with them too) and information about the submission, and submit to your selected blog! It's that simple. All the submissions I receive are organized on one page in order of date received and it makes it super easy for me to scroll down through all the submissions so that I can easily review them. Information about the submission is right in front of me - album info, contact info, vendor info (and links). Accepting or rejecting a submission is so easy. I can even put a submission "on hold" if I need more images or information from the submitter. The submitters are immediately notified by email regarding my decision. If a submission is accepted, I can easily update the status of the submission with the featured link once the submission is published and the photographer will notified by email. I am notified by email every time a submission is sent my way. I can put out requests for content I need which is amazing! I'm 34 weeks pregnant with twin boys and I know that once they'll be born, my free time will be very limited. So using TBL makes my life so much easier now and I know that once the twins will be born, it will continue making my life a little bit easier when it comes to reviewing submissions. MATT & JENTRY PHOTOGRAPHY: "There was a time where I had to read through the long and confusing "how to submit" details of each blog I wanted to submit my images to, only to be overwhelmed with the many things I had to do to fit each blog's specific requirements. I also had very little knowledge of the blogs that even existed. Submitting my images was a hassle and my work was not being published often at all. But then, I was introduced to Two Bright Lights by the local wedding blogger I know and I decided to sign up for the free trial. And my submitting process was forever changed. With Two Bright Lights, I can export my "blog worthy" images with one setting (not multiple pixel dimensions), upload all of those images to an album on Two Bright Lights and then very easily submit the album to a very long list of wonderful blogs out there in the entire world. I'm no longer stuck to submitting to just the blogs I know about. I'm no longer stuck exporting and re-exporting my images to fit the specs of bridal blog A through bridal blog Z. It's the same simple process, no matter which blogs, exclusive or non-exclusive, that I choose to submit to. And when my submission is not accepted by a blog, I can easily resubmit to another one. Before I started using Two Bright Lights, the hassle of submitting my images was a huge barrier, leaving me with maybe 3 features in the last 3 years. Since signing up for Two Bright Lights a few months ago, I have now been published over 20 times. It's also easy to promote the news when I've been published, helping my current and potential clients see me as a true professional. My reputation as a wedding photographer is getting better in my local market due to being featured on wedding blogs, and I'm feeling so inspired create better work all the time. There are a couple of little things I think that Two Bright Lights could improve (and I'm sure they will), but overall, I am undeniably happy with their service and what it has done and will continue to do for my business." DANIELLE CAPITO PHOTOGRAPHY: "Two Bright Lights has helped my business by helping get my name out there as an established wedding photographer. Getting published on a blog doesn’t always mean you’re going to book a ton more weddings, but it helps with name recognition. If you see a photographers name on one blog, then a few days later you see there name on another blog, and so on, you will remember their name and possibly start following their work, recommending them to people, and thinking they are great!! It also helps streamline submitting, because other then Style Me Pretty and Wedding Chicks, every other big name blog is on Two Bright Lights. So if you submit and your wedding or photoshoot, and it isn’t accepted, it’s super easy to just resubmit with the click of two buttons. Instead of having to re-upload your images for every blog you submit to as well as all the vendor info." FIERCE PHOTOGRAPHY: "Two Bright Lights has been a helpful tool for my business. 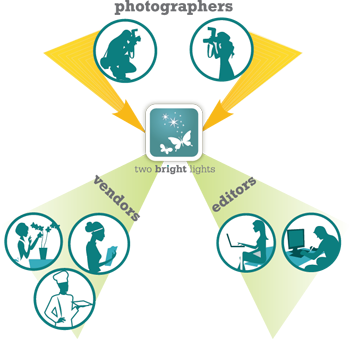 Photographers, along with other vendors, who get published and/or featured tend to get recognized more, and therefore have a higher chance of receiving inquiries from potential clients. Prior to Two Bright Lights, I had never been featured. However, I now have. Two Bright Lights really makes the whole process simple as well: from uploading the photos to reaching out to editors and publishers. It keeps everything organized and notifies you when a submission has been accepted, and furthermore when it has been featured. Finally, I have been introduced to and made aware of many more editors solely because of Two Bright Lights. In a nut shell, Two Bright Lights helps to open doors in so many ways." JEREMY & KRISTIN PHOTOGRAPHY: "A few months ago we decided it was time to begin submitting our work to wedding blogs. We knew it was a great way to increase SEO and that our clients would love when their session or wedding got featured. We felt like we would have to spend hours and hours resizing and watermarking images to different specs for each wedding blog…so we subscribed to Two Bright Lights. As business owners we are so busy with so many aspects of our business, and TBL saves us so much time and helps us get published on lots of our favorite blogs. It is helping our business grow, and helping to simplify our lives." TAMMY GILCHRIST PHOTOGRAPHY: "I joined TBL a little over a year ago and haven't looked back! I live in Mendocino California, a destination wedding area. A lot of times weddings I shoot are not filled with crazy beautiful details but focus more on the love between my couples and the ocean at sunset. Without those details it's nearly impossible to be featured on the bigger wedding blogs such as Style Me Pretty or Green Wedding Shoes. Not a problem when you're working with TBL. They have so many different types of blogs available it is possible to be published, which is exactly why I signed up with them. My advice on being published through TBL: I have found wedding blogs love a good love story. More times than not, if you are able to provide a great story to go with the images, you can get away with less wedding details (and as I noted above, I tend to not have a whole lot!). Also, do a little research, dig around TBL's site and find the blogs that really speak to you and your type of weddings you are shooting (coastal, barn, dyi...). You'd be surprised to find so many that are out there! And if you shoot other events such as engagements, elopements or parties there are blogs for them as well! I've been published for a number of different events and each time it's so exciting for me, the vendors involved and of course, my clients. They feel like rock stars when their images are online for the rest of the world to see!" EMILIA JANE PHOTOGRAPHY: "Two Bright Lights has changed the way I submit to blogs. They've made it so much easier for me, which means I now submit more frequently and am also featured more often! It's a super simple platform to create albums of events or portrait sessions, add my favorite images and a few paragraphs about why I love the work and want it to be featured. I love being able to find blogs by category and subject matter and then click to submit! If the work is accepted, editors have been faster about getting back to me through Two Bright Lights. And if the submission isn't accepted at first, they've made it really simple to select another blog and try again with someone else! All in all, it's a photographers dream to just integrate this into my workflow and be able to feature so many of my clients. Now I just need all of the blogs to use it!" If you would like to try out TBL for 30 days, email me at damaris [at] lemagnifiqueblog [dot] com and I will send you an invite!